Any help please? Thanks in advance. The first thing we need to do is add the extra fields to the category edit form using the hook edit_category_form_fields and we use a simple function that will print out the extra fields. As you can see i added 4 new fields and all of them are in an array Cat_meta[key] because that way we only create on row in the options table to save all of the category's extra fields instead of a row for each field. From the code above you can see that all of the extra fields we've added are stored in the database's options table with the name 'category_ID' , where ID is the id of the specific category we just edited and that means we can call this data in our plugins or theme files easily using the get_option function. As of Wordpress 4.4, the add_term_meta(), the update_term_meta() and get_term_meta() functions have been added. This means that the code as provided by MxmastaMills can be updated to use a far less hacky approach. Here is my update of it. There is only one field as I wanted to add a custom title, but it'll work the same for all the fields you want to add. 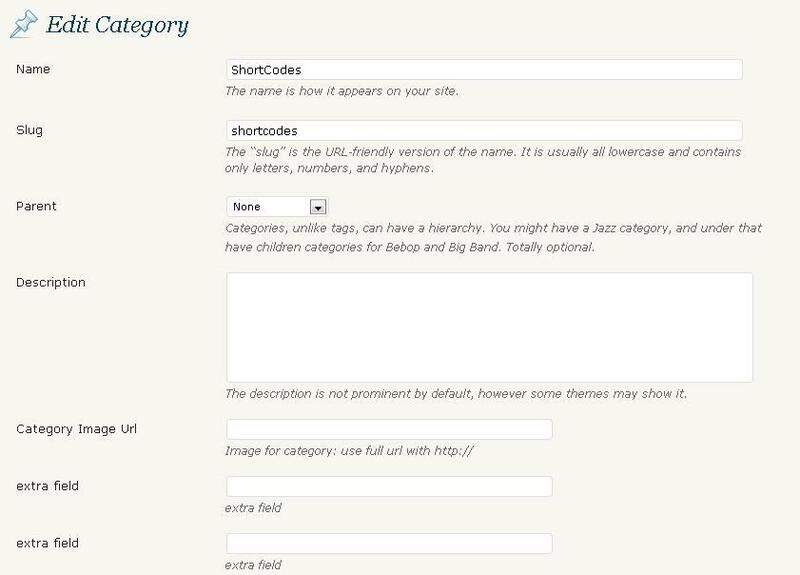 Custom meta for new taxonomies in WordPress 3.0. Any examples of adding custom fields to the category editor? How to add featured image for category (without a plugin)? How can I display a list of only categories which are marked as 'featured' in the backend? How to add a post without assigning to a category? How to allow Category Title to use <b> tags? Add category information beneath post? How to list child categories in custom category template?